To target a young adult demographic, Schick® Razors needed a specialized incentive that would appeal to new consumers of the Schick brand. On their sixteenth birthday, both male and female teens received a special "Happy Birthday" direct mail package from Schick. Inside was a free razor and Music Download Card. On the package were instructions that took the consumers to a branded landing page where they could view shaving tip videos and complete a short online survey about their shaving practices before selecting their free music. 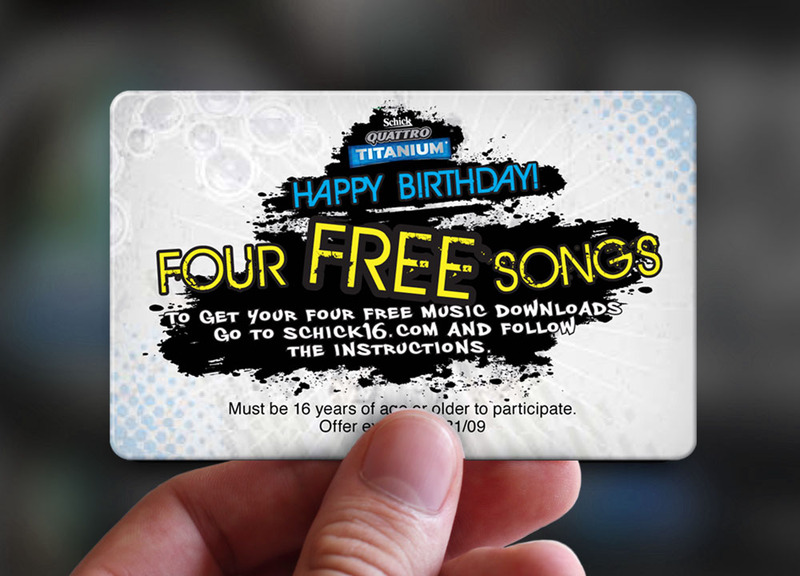 The Music Download on-pack incentive was a fun tie-in to entice customers to go online and interact with the brand. Over 100,000 razors and Music Download Cards were delivered to young consumers, many of whom will continue to remain loyal clients of Schick.